READINGTON, NJ — Memorial Day Weekend launches the beginning of Summer — and it launches balloons, too. 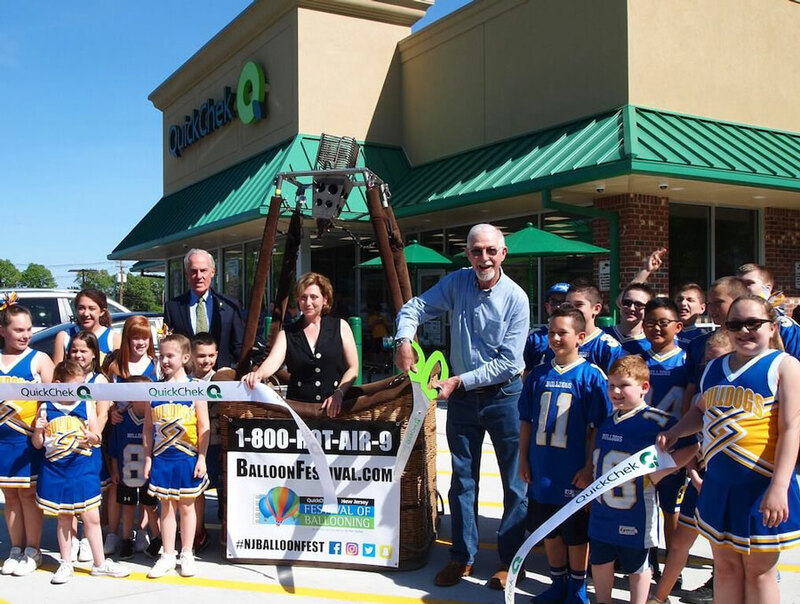 Tickets for the 36th annual QuickChek New Jersey Festival of Ballooning in Association with PNC Bank, the largest summertime hot air balloon and music festival in North America, go on sale at all 156 QuickChek fresh convenience market store locations throughout New Jersey, the Hudson Valley and Long Island starting Friday, May 25. The three-day Festival has been named the “#1 Thing to Do in New Jersey” by New Jersey Monthly magazine and the premier family entertainment attraction in the state by the USA TODAY Network. This year’s Festival features the awe-inspiring spectacle of twice a day mass ascensions of 100 hot air balloons from around the world taking flight over the scenic Hunterdon County countryside and a hugely popular live concert series featuring pop star Andy Grammer. The Festival takes off July 27-28-29, 2018 from Solberg Airport in Readington, NJ. New special shaped hot air balloons include the 120-foot-tall QuickChek saxophone which recognizes the Festival’s position as the largest hot air balloon and music festival; an 85-foot-tall Queen’s Guard in honor of the Royal Wedding; a 115-foot-tall puppy; a 75-foot-tall yellow bird and 75-foot-tall Rocket the Flying Squirrel cartoon character balloons. Returning favorites include the PNC American Flag, the world’s largest free-flying American flag; the 110-foot-tall Unique Photo Panda; the 105-foot-tall Bimbo white bear; and an 80-foot-tall Pepsi football. And making his big comeback, the 105-foot-tall Elvis special shaped balloon. The Progressive Stage is home to this year’s live concert series. PNC Bank presents Andy Grammer in association with Magic 98.3 FM on Friday, July 27. The New Jersey Lottery presents Lifehouse in association with the Festival’s nighttime hot air balloon glow on Saturday, July 28. Creedence Clearwater Revisited performs Sunday, July 29. Best-selling children’s recording artist Laurier Berkner of Princeton opens the concerts on Friday afternoon, July 27, presented by Hackensack Meridian Health. Festival admission includes access to the daily mass hot air balloon ascensions; lawn seating for concerts; a fireworks display; a nighttime hot air balloon glow; death-defying stunts by world record human cannonball David “The Bullet” Smith; age-appropriate children’s entertainment and activities; exciting interactive exhibits and hundreds of crafters and food vendors. Festival-goers can purchase advance tickets in any QuickChek store and save 43% off the gate price for adults, save 47% on children’s tickets ages 4-12, and no matter what time you go into a store you can enjoy additional savings during QuickChek’s “Summer of Subs” as select 6-inch sub sandwiches are just $3 and select 9-inch premium baguettes are just $6. Download the QuickChek mobile app to find the nearest store, where you can receive an additional $2 savings on Festival tickets through July 26. To locate the nearest QuickChek store visit www.quickchek.com; to learn more about this year’s Festival visit www.balloonfestival.com.